Now the final payoff, see it in action! It might not seem like too much sag until you realize that I’m reading the severely attenuated voltage. 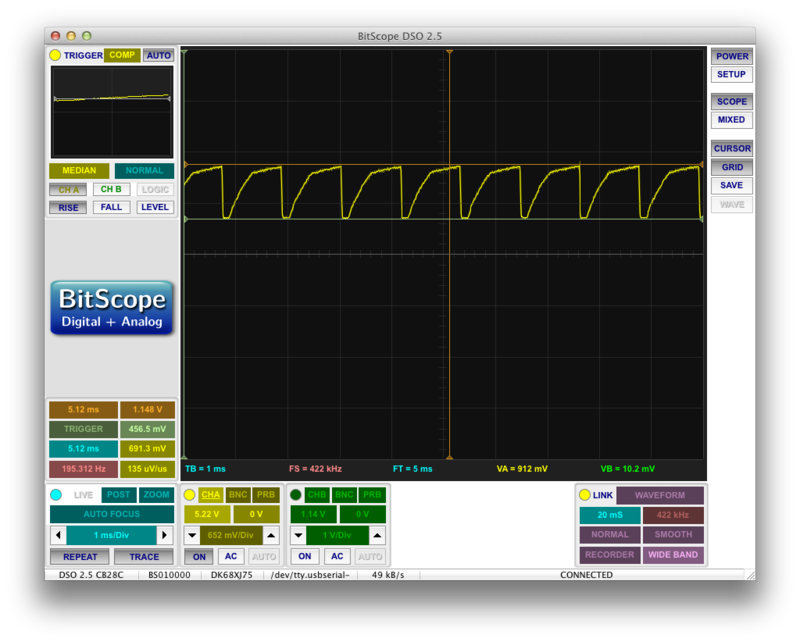 Looking at this graph, it looks like my voltage rail sags from 1.148V to 0.4565V. Scaling that up to full size, it’s going from 114.8V to 45.65V. That’s almost 70V of ripple! So how did this happen? My guess is that it’s a result of my calculations depending on a constant or nearly steady current draw. As the high voltage H-bridge switches back and forth, my EL panel is anything but constant. Hold on a minute, if I sized my components appropriately, shouldn’t I be able to handle the current draw? I sized all of my components assuming the worst case current draw from the EL panel! How much current is being drawn anyway? We know that my output capacitance is .03$$\mu$$F, so let’s see if we can estimate the output current based on the rate of voltage drop across this capacitance. This assumes that the transformer contributes nothing, but you’ll see why that’s okay. There are likely a number of factors contributing to my huge spike in current draw. One of the reasons is that my model of EL materials was incorrect at the time of writing this post. More details here. Remember what I said before about regulating flyback converters and fluctuating current draw? I believe that my flyback regulator IC is having trouble with this rapidly changing current draw. After all, once the EL panel is fully charged, I’m basically presenting an open circuit load to the flyback converter. To prevent the output voltage from rising, the converter will have to severely drop its duty cycle. Once my EL panel polarity is switched, there is a huge current draw, and my driver IC isn’t ready for it. It can’t react immediately (because the flyback is not a first order system), so there is a delayed response. 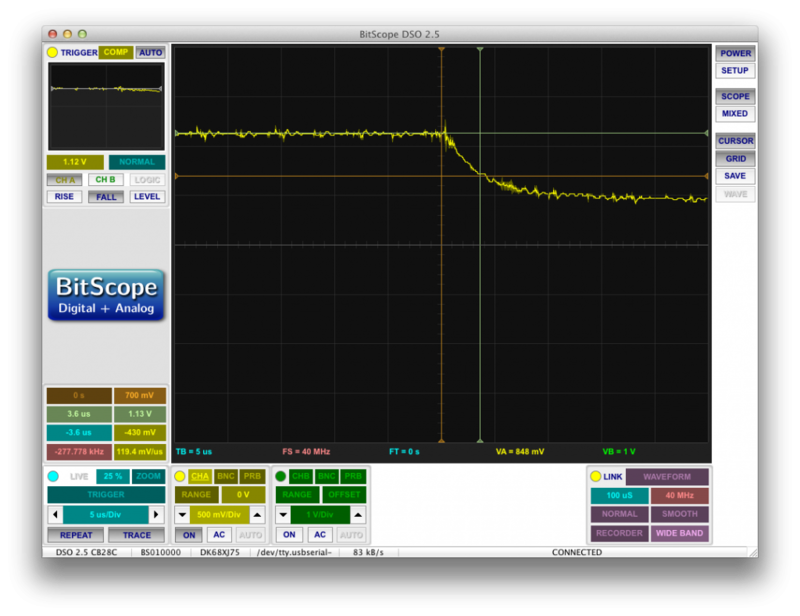 This is why you can see a short delay before the output voltage starts to rise again and why it’s okay to ignore the transformer’s contribution to the output current during the initial slope. You can actually see the system overshoot and oscillate a little in the following trace. This was my voltage ripple with a piece of EL wire as the load rather than my panel. This problem could be solved a few different ways. I could add more output capacitance to my flyback, but this would be hard considering that all my caps need to be rated for 120+ volts. I could also build a better flyback converter that I could continuously adjust in firmware so that it can prepare for upcoming current loads. 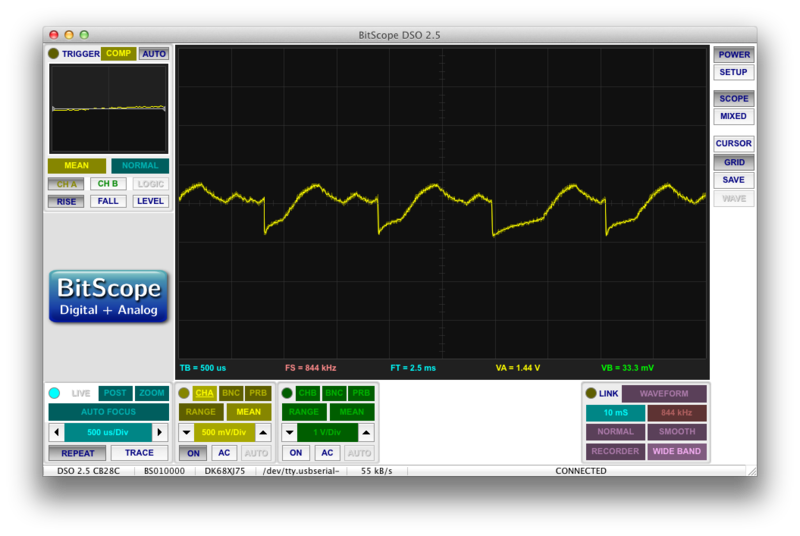 Adding more bypass capacitance “worked” as you can see in this post. I measured the current draw of my circuit and found that it never gets over 200mA at full brightness, so that means that my batteries should last 10-12 hours on a single charge! Can you say “over engineered”? If I were to do it again, I would probably try to stick with some more conventional alkaline batteries. One problem I somehow completely failed to predict was the sound the power supply produces. You can very clearly hear a buzzing tone at the frequency that the panel is being driven. This tone is caused by quickly oscillating magnetic fields that cause components to vibrate (you might remember hearing a 60Hz hum when standing under a power line; same thing). For a sample of the sound, check the end of the video. This isn’t too much of a concern for me because this device is clearly meant to be used in loud environments where the buzzing sound is drowned out. My bigger concern is that this thing produces a lot of stray alternating magnetic fields that will be picked up by an electric guitar and highly amplified. Considering I made this for a guitarist, this is a really bad thing. I might investigate this problem and try to find a way to reduce the radiation, but honestly, with all the crap going on in my power supply, I doubt I’ll be able to improve it much. Instead, I’ll probably end up keeping this for myself and making the guitarist something else. I actually improved this buzzing problem in this post. I am a little disappointed to find how dimly my EL panel actually lights up. It seems to just be the nature of the material that it can only get so bright. All that means is that you have to be in a fairly dark room to see anything. I’m honestly just super excited to have this project (and this blog post) finished. My last real post was over a month ago because I’ve been spending so much time on this thing. If I had any idea how complicated it was going to be from the start, I would have split it up into multiple blog posts during development. Oh well. Anywho, it was a cool project and I really feel like I contributed something to the web in the field of controlling EL materials. I hope that someone takes what I learned and makes something even cooler.